Bishop was a former member of the Bacchus Motorcycle Club in Halifax. He then transitioned to the Gatekeepers, occupied the position of president, and from there to the London-East Hells Angels. 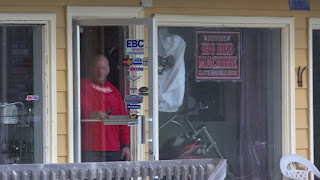 Police say the members of the London-East club in Musquodoboit Harbour may be just hang-arounds at this point, but in time they will be full-patch members of the Hells Angels, giving them real power in that world. 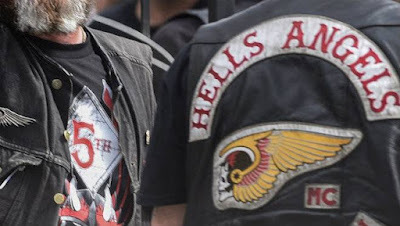 The Hells Angels want to get back into Nova Scotia and the Maritimes to have influence at the ports, and to absorb the Bacchus Motorcycle Club. 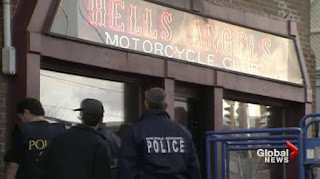 Police say they believe organizing efforts by the Hells Angels in Nova Scotia have taken a “significant hit” with the arrest of David James Bishop, 35, in a drug raid. He was arrested along with two women at a home in the Halifax suburb of Cole Harbour last Wednesday. All three now face a string of drug and firearms-related charges. Police say they found a large quantity of drugs along with OMG related paraphernalia, firearms and ammunition. The long list of charges includes: trafficking in cocaine, ecstasy, and cannabis resin; two counts of possession of a loaded restricted firearm; and two counts of possession of a weapon for a dangerous purpose. Bishop is well known to the law enforcement community in Halifax and was a former Baccus MC member. Bishop is a “hangaround” member, which is steps away from becoming a full-patch member of the Hells Angels.